Today I learned that Vincent van Gogh sold only one painting in his lifetime, The Red Vineyard, for 400 Francs (about US$1,600). It is now considered to be one of the most valuable paintings in the world. In 1906 Anna Boch sold the Red Vineyard for 10,000 francs at the Galerie Bernheim, 25 Boulevard de la Madeleine in Paris. The reason for her sale was not the need of the money. (The money was reinvested in Signac paintings later donated to the Royal Museums of Fine Arts in Brussels) but the fact that she was intimidated by the talent of van Gogh. 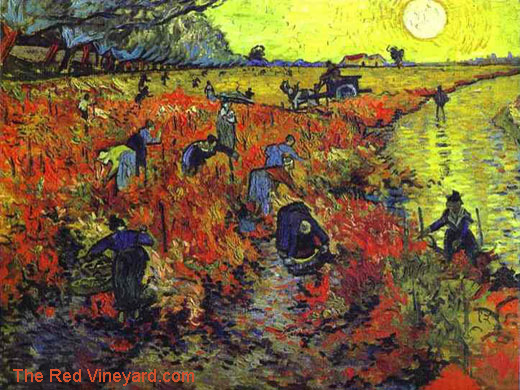 If the "Red Vineyard" should ever be sold, (which is not likely to happen) it might be the world's most expensive painting as besides it's "Beauty" it has the "Legend" of being the only painting, Vincent van Gogh probably the world's most famous artist, sold during his lifetime.